Holiday magic is a real thing. A feeling deep in your soul. A feeling that brightens your smile, lights up your eyes and has you humming along with the Christmas music. 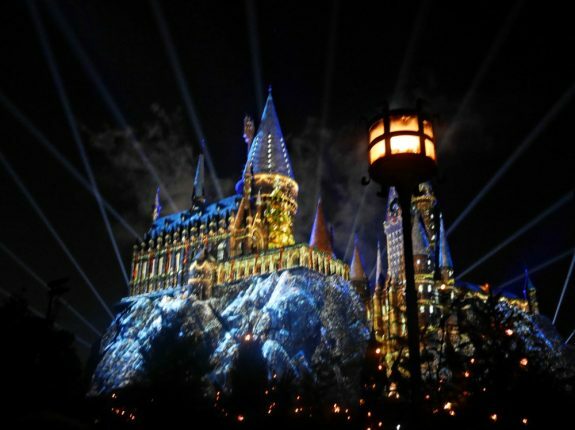 At Universal Orlando Resort, there’s a little extra special magic thrown in, thanks to the powers of Harry Potter and his friends along with the imagination of thousands of creative minds. 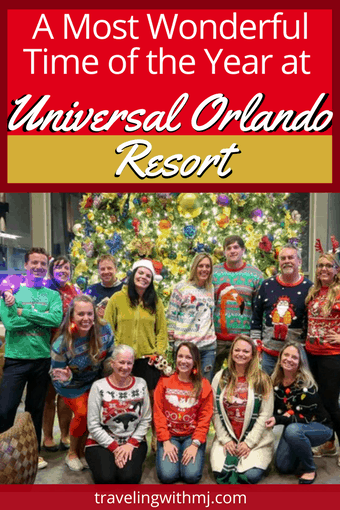 As an ambassador for Universal Orlando Resort (that’s a photo of all of us above in our ugly Christmas sweaters), I was invited to a media preview for their holiday events and, boy, was I impressed. I think you will be as well – and while it’s not too late to make your plans, you’d better get hopping. 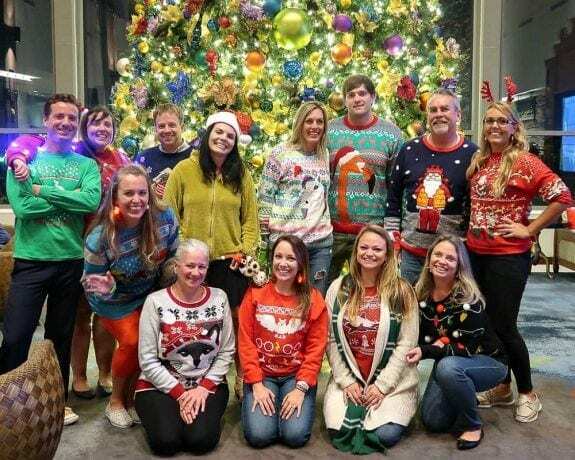 Holiday festivities run through January 6th, 2018. 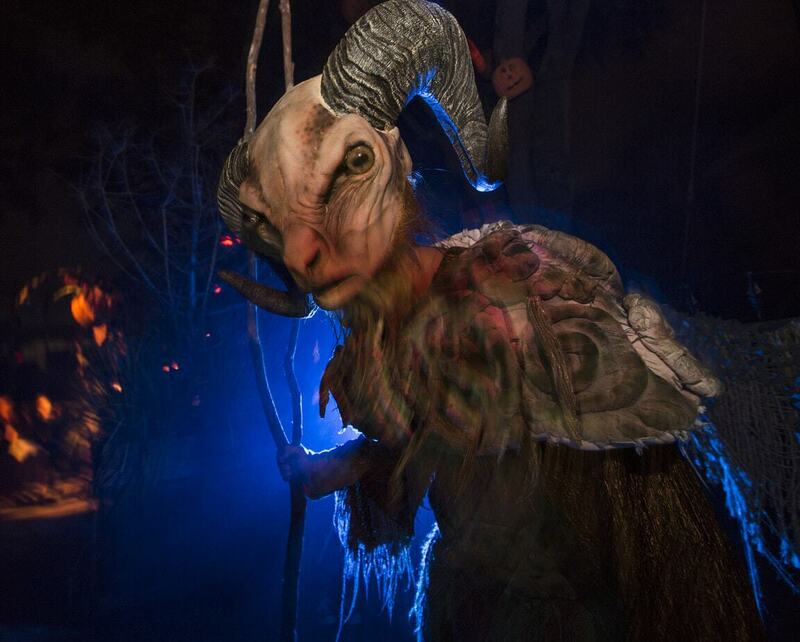 Here are my five favorite magical holiday experiences at Universal Orlando Resort. This was probably my favorite part of the Universal Orlando holiday magic – the Universal HOliday Parade featuring Macy’s. It’s complete with floats, those big balloons soaring overhead, and all the balloon walkers making sure they go where they’re supposed to go. If you’ve been to the Macy’s Thanksgiving Day Parade in New York City or seen it on television, then you’re familiar with the large character balloons that soar over a parade route. Fun fact: The first balloon soared way back in 1927 (it was Felix the Cat, in case you are wondering), and Macy’s has continued the tradition ever since. 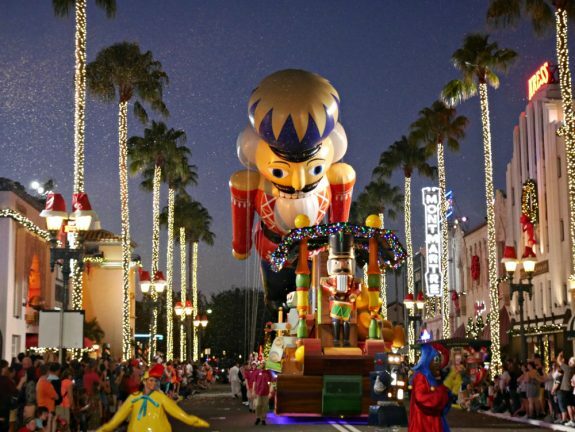 For the Universal Orlando parade, there were Minions, and Crazy Donkey, and Gingerbread Men, and the Nutcracker, so many more. Many of the beloved characters rode the floats. And, of course, there was Santa. Finding the best viewing spot for the parade can be a challenge. The parade starts at 5:30 pm, but you should plan to be there an hour or two early if you want a prime viewing spot. That might seem like a lengthy commitment, but it’s worth it. My preferred viewing spot was on Hollywood Boulevard, right across from the Brown Derby. Other friends swear by a spot right in front of The Mummy. All the Whos in Who-ville invite you to celebrate the holidays with them – and to help warm the cold, cold, heart of the Grinch – with The Grinchmas Who-liday Spectacular in Seuss Landing (Islands of Adventure). 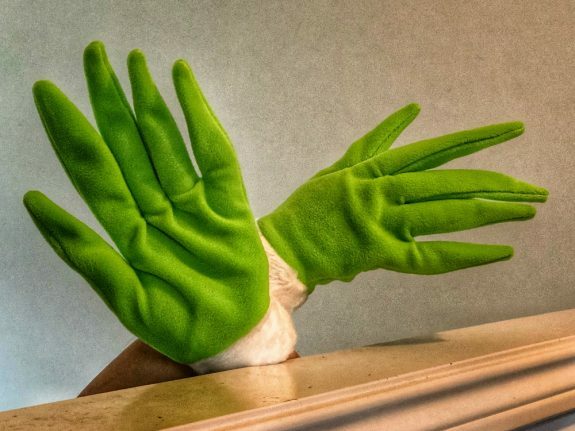 If that doesn’t banish your inner Grinch, I’m not sure what will! Super Seuss fans can have breakfast with the Grinch and his friends at Circus McGurkus, priced at $35 for adults and $21 for children (this is a separately ticketed event). Breakfast is held most days, 8-10 am, and reservations are required. You can check the schedule here. Walking around the resort – from the parks to the shops to the holidays – you’ll hear lots of holiday music. It goes perfectly with all the beautiful decoration (which I wish I could re-create at home). I soon found myself humming Andy’s Williams “It’s the Most Wonderful Time of the Year” pretty much non-stop. And I’m still humming it while I’m writing this. 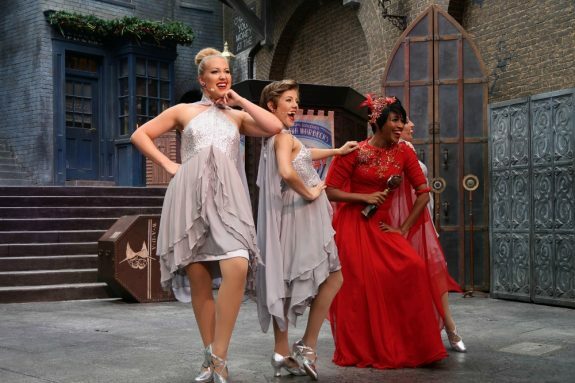 The holiday season also features special performance around the parks, including the Frog Choir in the Wizarding World of Harry Potter (Islands of Adventure) and Celestina Warebeck and the Banshees in Diagon Alley (Universal Studios). Maybe you’ll find yourself humming “My Baby Gave Me a Hippogriff for Christmas! Mannheim Steamroller has a free concert schedule on various dates through December 17th, 2017. Check for information based on dates of your visit. I know in the warm Orlando weather, there’s not the need to warm up like there is here in Seattle. However, after the sun went down there was something comforting about sipping this delicious butterscotch-y, vanilla-y, creamy blend of goodness. You’ll have to ask specially for warm ButterBeer as it’s only available seasonally and doesn’t appear on the regular menu. You can find it at the Three Broomsticks, Leaky Cauldron, and Hopping Pot. Fun tip: My friend Rachelle suggests taking your ButterBeer over to Starbuck’s and asking them to add a shot of espresso. That would wake me up in the morning. 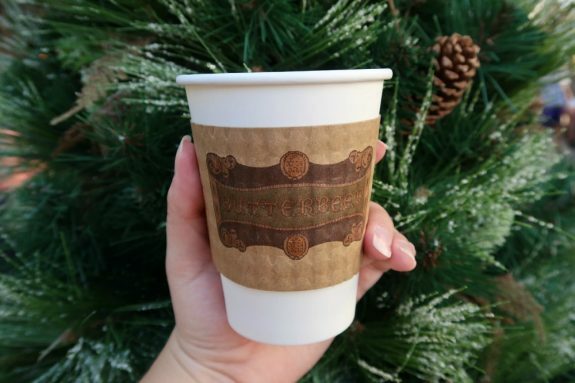 If you don’t have immediate access to Universal Orlando and warm ButterBeer, I’ve been told that the Smoked Butterscotch Latte at Starbuck’s is a close approximation (available seasonally only). I confess to being a bit of a Harry Potter fan-girl, and while you won’t see me stalking anyone, whenever I’m at Universal Orlando, I spent a fair amount of time immersed in Harry’s magical world. This was the first year that Wizarding World and Diagon Alley got into the holiday spirit, and everything was decked out with garlands and other decorations. While the dragon didn’t sport a Santa cap, there are plenty of other details that kept me in the holiday spirit. The most magical of all, and barely nudging out the parade as my favorite event of the holiday season, is the Magic of Christmas lights and fireworks display at Hogwarts. It was beautiful, it was impressive, it was jaw-dropping, it was magical. I tried to catch a little of it on video, and although not my strong suit, I hope it makes you feel a little bit like you are there. The show starts at dusk, so the times are variable and runs every 20 minutes. You’re going to need to get there early for a prime viewing spot – or stick around for multiple shows and keep working your way into a better location. Some of the entrances are closed off during the show, including my preferred access near Jurassic Park (one of my favorites rides), so watching from the bridge isn’t an option. I’d recommend going early and snagging your spot for the first show or staying late and catching the last one. There are all sorts of bundled admission options for Universal Orlando, from the one park, one day pass to multiple parks, multiple days pass to hotel and admission packages. What’s works for one visitor may not work for the next, so while I’ll share my recommendations, you’ll need to calculate which works best for you. My recommendation is a hotel and multi-day park-to-park package. The Hard Rock Hotel is my preferred choice as guests receive an Express Pass (for early admission to the parks) and it is within walking distance to CityWalk and Universal Studios. Following closely behind is Portofino Bay, an Italian-themed property that also has a spa. A convenient water taxi shuttles you to City Walk and adjacent Universal Studios. The convenience of the Express Pass combined with close proximity to the parks, allowing you to easily go back and forth, is a value luxury option. Photo credit: Cailin O’Neil provided the photos of Celestina and the ButterBeer. Disclosure: As previously mentioned, I am a member of Universal’s 2017 Blog Squad, an ambassador position for the resort.